The Janitors series takes even the most ordinary objects from the school building and imbues them with magical powers: Windex has the power to turn objects into glass, a plunger can make an SUVs light enough to carry at the tip of the suction cup, and a Dumpster is transformed into a prison This series sets the stage for the story of how school janitors, students, and their parents battle the evil Toxites who have invaded the school, making children tired and lazy by messing with their brainwaves to make them stupid The stakes have never been higher, and you've never seen squeegees do this before It is a wild and slightly unsanitary ride as Spencer, Daisy, and the rebels find themselves chased by Mr. Clean's new and terrifying breed of toxite the Sweepers. Time is short. With the fabled Manualis Custodem in hand, Spencer must figure out how to summon the founding witches if they ever hope to mop up and save education. Tyler Whitesides worked as a janitor at an elementary school to put himself through college. 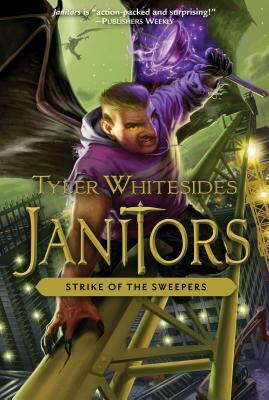 He is the best-selling author of the Janitors series. He graduated from Utah State with a degree in music. In addition to writing YA novels, Tyler is an avid composer and arranger of instrumental music. He and his wife live in Logan, Utah.